Safe at open water, minimal maintenance, shallow draft, low air draft, trailerable, ready for all seasons, no fossil fuels needed, tough and classic looks, compact dimensions, silent & clean motoring, best-of-breed modular and easily upgradeable systems and finish, comfortable and easy to handle by a couple or individual, 100% Dutch quality. Adventurous couples and individuals wanting to enjoy the most beautiful places and waters with respect for the environment, without worrying about weather or distance. For those who feel time should be spent on the water, not wasted on maintenance and preparations. On a boat that fits under the narrow bridges of the Amsterdam canals, and dries out on tidal rivers and estuaries. And, as if it were a camper, can easily be moved to the Spanish ria’s, Venice, Norwegian fjords, Croatic islands or the Balaton lake in Hungary, simply by towing it behind your own car. A boat with the comfort from home, in summer and winter, for which the primary maintenance will be a high pressure wash down. In order to make the A10 trailerable, and to give it a low (air) draft, she has to be built within certain dimensions and (transport) weight must be kept to a legal minimum. 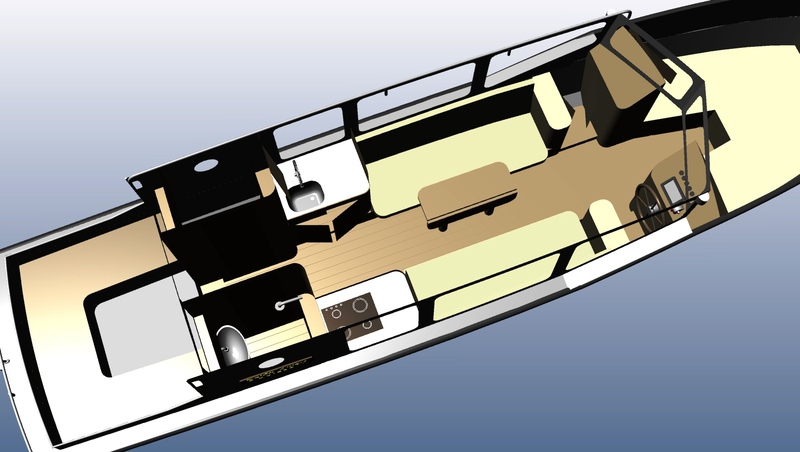 Meeting those requirements makes the A10 very suitable for using an efficient full electric drive line, and by combining this with the use of light and strong aluminum results in low maintenance and a motor boat that can be enjoyed all year round. Using electrical components weight distribution is optimal for comfort at sea, and they provide independence from shore with the luxuries of home. It’s all about the reinforcing effects that are the result of choosing the right combination of requirements.